Bite on gauze to control any bleeding and to allow a blood clot to firm. It should be left in place for 3 to 4 hours after your extraction, but change it as needed. To minimize any swelling, apply a cold compress to the outside of your face for 10-minute intervals. It is best to relax for 24 hours after your procedure, then limit your activities for 2 days. Use a warm salt water rinse to clean your mouth after 24 hours. You need to keep the extraction site clean but be careful when brushing and flossing your teeth. Do not rinse your mouth or spit vigorously, which can dislodge the blood clot. Do not smoke to prevent any healing complications. Eat soft foods, like yogurt, soups, and smoothies. As you heal, gradually reintroduce more solid foods. Prop your head with pillows when sleeping to avoid any prolonged bleeding. 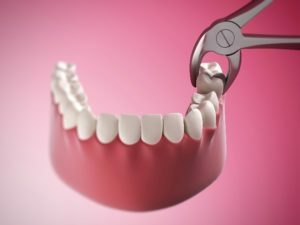 Most tooth extractions heal without any complications, but there are times when an issue may arise, such as dry socket. This is a painful condition that develops when the blood clot comes loose too soon. If you have severe pain, it is best to call your dentist right away. If you cannot control the bleeding or it lasts for longer than 24 hours, contact your dentist. It is normal for there to be some slight bleeding or discoloration to your saliva for a couple of days after your extraction. Redness, swelling, or excessive discharge. Cough, shortness of breath, chest pain. On average, you can expect the initial healing process to take 1 to 2 weeks. Before your procedure, your dentist will thoroughly explain the process and your go-home instructions for an easy recovery. Allheart Dental Implants & Orthodontics provides advanced dental services from our modern dental office to improve your oral health. In addition to general dentistry, we also perform tooth extractions. If you need to have a tooth removed, contact our office today to schedule your consultation.